Collection Lasting Perfection Powder: As I said in my Deadpool inspired makeup look, I have a lot of makeup products from the brand 'Collection'. I've always loved their products as they're affordable but still good quality. I had to repurchase my face powder this month as I was getting very low and I decided to buy Collection's 'Lasting Perfection Ultimate Wear' powder again. This was the same one as I was running out of and I have to say it's the best powder I've used. I absolutely adore this powder, it sets my makeup great and gives me such a flawless finish. This isn't just a June Favourite, I have loved this product for a while and will definitely continue to use it. Herbal Essences Heat Protector: Next up in my favourites for this month is my Herbal Essences 'Seductively Straight Heat Protection Cream'. 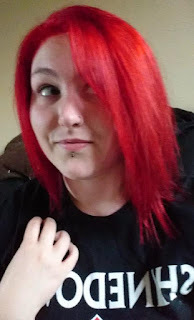 Since I had my hair dried red I really wanted to find a way to protect my hair, as I've been straightening it a lot more. I used to use this and not see much difference, but I've found out that was because I wasn't using enough of it! I have shoulder length hair that's quite thick, and I've found that 3 or 4 pumps works wonders on my hair! It leaves it feeling soft and definitely helps reduce frizz, as well as protecting it against the heat of my hair dryer and straighteners! I'd recommend this product for people with thick hair that needs taming, but don't overdo it! If I use to much it ends out being heavy and I can feel the product in it. Makeup Revolution Mermaids Forever Palette: I bought 2 of the Makeup Revolution 32 palettes and I absolutely adore both of them! They're both great quality and great prices, but I have to say that I've been loving the mermaids Forever one a little more this month. I've managed to great some great looks using them, my Deadpool look made use of it and I have a few other looks to post about that I'd thought about and found that this palette worked best! It has such a diverse range of exciting colours and really makes you want to go crazy with your makeup! Although the quality is good, I don't think it's quite as good as the other palette I own, which is the 'Flawless Matte' one, but it's still good enough to come up with great looks that really stand out! 'The Rats' by James Herbert (book): I've always loved reading, but recently I was struggling to find something that I wanted to read. I decided that I wanted a horror book and I asked my dad what I should try. He recommended 'The Rats', which is James Herbert's first book. It was released in 1974 and if this is anything to go by, then I will love more of his books! It's so chilling just because it is so realistic and possible, I'm only a quarter of the way through so far but I'm struggling to put it down. It's definitely got the cringe factor and keeps you wanting more! If you're into horrors and sort of mystery based books, then I'd give this ago. On another note, the cover of this version is AMAZING. It's the 40th Anniversary edition and I think it's so pretty! The corner looks as though it's been nibbled away by the rats in the book and the title includes silhouettes of the rats! Such a good book and is worth a read! Katy Perry 'Meow' Perfume: I've had this puurfume for a while now (see what I did there?...) but I recently started using it more and I absolutely love it. I'm not very good at describing scents but it's a very young scent (if that makes sense). It's fruity and floral and is long lasting, I can go to work with this on and it lasts all day, but it isn't overpowering. I have about half of the bottle left (it comes in a cute little cat bottle!) so it should last a while longer, but I think it's a really good daytime scent, perfect for the summer time! Black Sabbath (band... duh): My last favourite that I'm going to list this month is the amazing band Black Sabbath. As I said in my Download Festival post I've always enjoyed listening to Sabbath whenever they are on, but I've never gone out of my way to listen to them. My dad bought me their album Paranoid on Vinyl for either Christmas or my birthday and since I've started listening to them more I've been hooked! They're exactly my type of music! Rocky, bluesy and all other categories they fit into. Seeing them at Downladd was amazing and I'm lucky enough to have bought tickets for their farewell tour next year! I cannot wait to see them again and listening to them makes me feel great! Some of my favourite songs are: Behind the Wall of Sleep, N.I.B., War Pigs, Orchid, Fluff, The Writ, You Won't Change Me, It's Alright and SO many others, but it would be far to long to list!